Women, here is a fashion tip when buying sneakers after forty. Athletic footwear should be classic, neutral, and able to match most of your clothes. You’ll wear that athletic footwear more than you think so make sure your sneakers look chic and match well with your wardrobe. It may seem boring but trust me that the cult classics look better than the trendy athletic shoes. When it comes to buying womens shoes for working out, the simpler the color the better. Try to buy classic athletic shoe brands such as Nike, New Balance, Puma, Reebok. Choose neutral colors (see right) that can coordinate easily with a variety of clothes. Go for a chic classic look and remember that you always run into people you know when wearing your bummy clothes. Don't get caught in zany tennis shoes. If you stick to the basics you will always look presentable in public. I know it’s a fashion challenge to look good in a pair of tennis shoes after forty, but it is possible. Whether its Nike, New Balance, Adidas, Converse, Puma or Wilson, the simplest fashion tip for women over forty is to keep the color and style of their athletic shoes classic and simple. The classic white athletic shoe still rules supreme. It’s nothing personal against colorful sneakers, but they are just too hard to match with clothes. Multi-colored sneakers only look good if paired with solid color clothing, and therein lies the problem. You shouldn’t have to tone your wardrobe down to match your sneakers. It should be the opposite. Your sneakers should blend in easily with clothes, whether they be your athletic clothes or something you wear walking or to run errands. Tennis shoes have a way of sneaking onto your feet. You might buy them for the gym, but they will find themselves on your feet for the elementary school drop off, store run, or quick errand. Of course, that’s the exact moment when you run into literally everyone you know. 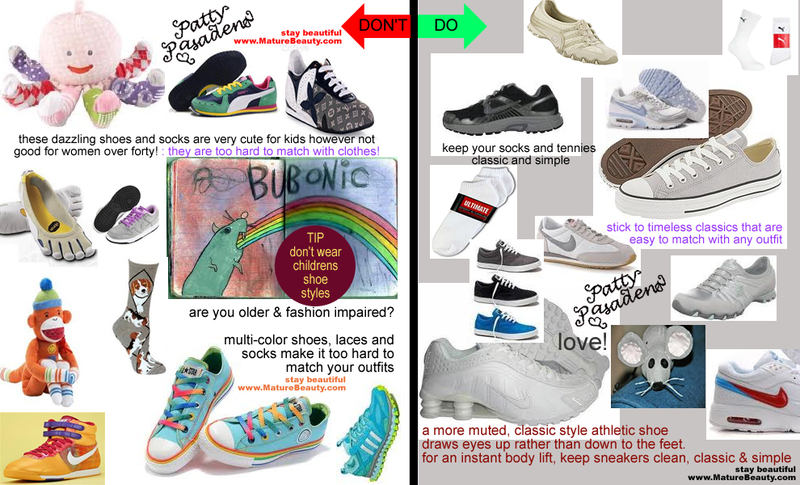 Play it safe and buy athletic shoes that match a wide variety of clothes. A good athletic brand shoe will look great if you just buy it in a neutral color. Not everyone is a fashionista who can put together perfect color combinations. Most women on the street get a bit of a mess going with their clothes, seeing as most clothes have patterns, prints, colors and details to them. Sit at the mall one day and people watch and you will see what I mean. The biggest tip for the fashion impaired is to always simplify, stick to the classics, and opt for versatile colors. If you combine business and noise in your clothing, accessories and purse together with bright color sneakers, the result will be a clashing fashion don’t. You’ll look like a kaleidoscope not a supermodel. Your Coach logo print bag will not look real good with teal and turquoise sneakers, no matter how much it costs. The more patterns and colors you don, the worse its going to look. Therefore, stick to simple sneaker colors and classic brand names. White, tan, gray, navy, even black sneakers look chic and are easy to match to your outfits whether they be casual clothing or workout clothes. Another plus of choosing simple colors is that you want minimal attention drawn to the shoe. If you carry any extra weight, you want a neutral sneaker so that eyes are drawn upward towards your face. This will give you an instant slimming effect and free body lift. Keep sneaker colors simple, clean and classic and you are going to be far closer to that effortless chic look you desire. If you wear sneakers with jeans and want to look skinnier, try a color that blends to the jeans. For example, pale blue or light gray for faded jeans or navy blue for dark blue jeans. This neutralizes and blends the foot to the leg and gives you a slenderizing effect. Keep shoe fabrics, laces, two toning and color accents to a minimum for a clean polished look. Avoid bulky, clod hopper mesh materials. White tennis shoes look great, as do all time classics such as neutral colored Nike or even Converse. If you like color, go for only a small hint. For example, the classic Nike with the red swirl shown at the bottom right of the photograph is a timeless style. Accents should be minimal though, because when you get full on two toning in bright colors it gets out of control and only promises to clash with all of your clothes. See photo example for don’t at the left and do’s at the right. Clean white socks look best, or if you have a darker color sneaker then black or something to blend in well with the shoe. Again, if you start to get into the Christmas type patterns and animals decorative motif socks, it only serves to draw unwanted attention downward to the feet. If you have nice legs wear the low profile socks that only go to the ankle, otherwise a regular height athletic that goes up just a bit further is fine. The idea is to keep your look neat, clean, and classic. Minimize the chance that your shoes will clash with anything you wear. Contrast is fine, for example, a white t-shirt, blue jeans and navy classic sneakers is fine. The white would contrast with the navy, but not clash. Your whole outfit should have only two or three complimentary colors going. The more colors you wear, the more you have the potential to clash and look sloppy. The less colors, the better. Check in the mirror and if you have more than three colors going on then consider changing clothes to neaten up your look. Just like netting material, multiple colors, bright colors, and clunky sneakers make you look tacky, colorful laces make you look tacky. If you add a lace color then that is one more chance that that color will clash with everything else you are wearing. Keep laces white or toned down to match the shoe. As for shoe styles, comfort is important. However, you don’t want to look like you are wearing orthopedic shoes or nursing shoes. To avoid the senior citizen fuddy-duddy walking show look, try to stick to sporty tennis shoes and well known athletic shoe brands. Something like Nike, Puma or Reebok works. Their shoe styling is up to date and you can wear a basic color such as white without looking frumpy. The problem with sneakers is that they come in tons of colors and sizes now. All the designers from DKNY to Steve Madden and Sketchers make sneakers. If you look at the wall at Sport Chalet you’ll be dazzled and blinded by the variety of styles and color combinations. If you are using the sneakers to work out and have a good sense of style, then you’ll match the sneakers to neutral outfits and nothing will clash. That is a big if however. Most women do wind up running around in those sneakers for errands. Suddenly, those bright colors when matched with your purse, shirt, pants and coat, look totally horrendous. To be on the safe side, opt for colors that can match just about anything you wear be it athletic clothes or casual street clothes. Style wise, opt for the classic athletic shoe brands. Finding sneakers that feel and look good on a woman over forty can be a challenge. The key to finding those sneaks is that you must refuse to be bamboozled by the dazzling bright colors and styles. They look good on the shelf and on a twenty something in a pony tail, but may not look good on you. Refuse to go color crazy and opt for the tried and true colors. White, tan, gray, black, blue, navy are the cult classic colors and they always look chic. Go for simple leather or canvas styling and nothing too trendy. Avoid toes, woven fabric, and futuristic shoe styles. Classic Nikes, Adidas, Converse, New Balance, Puma or Reebok’s are all you need. Forget the contrasting laces as they just draw attention to the craziness. Crisp white socks or low profile neutrally colored socks that blend with the shoe are what you want. Forget about the decorative socks. Don’t even get the ribbing band of color on the top of the socks as that’s introducing yet another color. If you get a sock with a purple rim it might be great with one outfit but when those are the only clean socks on hand and you throw it together with a totally clashing outfit of magenta and black, that sock’s trim color will wreck the look. Even though they are just tennis shoes, they should nonetheless look classic and chic. Sneakers and socks that are age appropriate are going to make you look fashionable and infinitely more beautiful. Forget about zany colors and motif accents. Buy that stuff for your kids. About the only accent you should tolerate is a tiny black Nike or Puma logo. If that.